These 1 gallon stainless steel ball lock kegs (also called Cornelius kegs or Pepsi kegs) are an excellent choice for storing and dispensing homebrew beer, wine, soda, kombucha, and cold-brew coffee. They meet NSDA voluntary standards and are NSF (National Sanitation Foundation) approved. The ball lock kegs feature permanently molded rubber bottom skirts, durable stainless steel strap handles, and easy-to-access ball lock fittings that make clean-up simple. 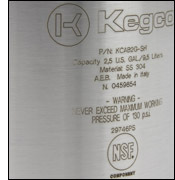 The stainless steel lids fasten tightly to the bodies and have pull ring style pressure release valves that make it easy to depressurize the kegs. Working pressure must not exceed 130 P.S.I.G. Each keg in this set of two measures 9.5" tall and 9" in diameter.